Immigrants fear what Trump will do to "sanctuary cities"
It’s not yet clear whether, or how, the Trump administration could make good on a promise to end "sanctuary cities." But the simple fact that he says he’ll try is enough to terrify many undocumented immigrants in Texas. Editor's note: A version of this story appeared in The Washington Post. Patricia Gomez has already experienced the paralyzing fear of almost losing her father. The memories from 11 years ago are hazy, but Gomez, a 21-year-old undocumented immigrant from Honduras who has lived in the United States for 14 years, remembers when her father was pulled over in North Dallas for speeding. “It was a very close call,” Gomez said, recalling how her father, who is also undocumented and cleans homes for a living, was taken into custody but later released. For years, people like Gomez and her father have lived in an uneasy gray zone when it comes to the random encounters between undocumented residents and law enforcement. In hundreds of cities and counties, local governments have opted — either informally or formally — to limit local law enforcement’s involvement in enforcing federal immigration laws, particularly when they come into contact with undocumented immigrants. In these “sanctuary cities,” officials have attempted to ensure that immigrants can get help from police or report crimes without fear that Immigration and Customs Enforcement agents will swoop in to detain them. But Donald Trump’s election to the presidency this month threatens to end that. Trump has railed against “sanctuary cities,” promising to cut off federal funding to municipalities "that refuse to cooperate with federal authorities." It’s not yet clear whether or how the Trump administration could make good on that promise. But the simple fact that he says he’ll try is enough to terrify many undocumented immigrants. For many of the immigrants living in “sanctuary cities” and places with less-formal policies, Trump’s presidency could throw off the precarious balance that has allowed millions of undocumented people to live and work in cities across the United States for many years. They are the construction workers that build Americans’ homes and office buildings and the housekeepers and janitors that keep them clean. They are the fruit and vegetable pickers and the restaurant workers — both putting food on their tables. The nature of the sanctuary policies offered by cities and counties varies widely, which is part of the reason it’s hard to predict how Trump could crack down. Cities in states such as California and Illinois have adopted strict policies that limit collaboration between local law enforcement and federal officials when it comes to the enforcement of immigration laws. In other states, such as GOP-controlled Texas, there are no true “sanctuary cities,” but police officers in cities across the state have opted not to ask the immigration status of people they arrest. These policies date back to as early as 1979, when Los Angeles enacted a special order prohibiting officers from initiating “police action” with the objective of determining a person’s immigration status. Similar policies proliferated in the 1980s and extended to New York and other large cities. Trump isn’t the first right-wing critic of sanctuary cities. For years, conservatives and advocates for tighter immigration laws have claimed that a lack of cooperation is making “sanctuary cities” less safe because it results in the release of dangerous individuals who should be deported. “Sanctuary policies needlessly create new victims, and they don’t lead to more crime reporting or better relationships between authorities and immigrants,” said Jessica Vaughan, director of policy studies for the Center for Immigration Studies, which supports tighter immigration laws. With control of the White House, Trump could try to make it more difficult for municipalities to limit local law enforcement’s ability to enforce federal immigration laws. But immigration lawyers and civil rights activists hope judges might still protect the status quo. Courts already have blocked laws that require police officers to verify the immigration status of the people they arrest or question. One of the most prominent examples is Arizona’s law that required police officers to determine someone’s immigration status if they had a “reasonable suspicion” they were in the country illegally. Though the U.S. Supreme Court largely upheld the law when it was challenged, the state’s attorney general earlier this year rolled back parts of it and outlined limits on enforcement of immigration laws by police as part of a settlement of a separate lawsuit brought by immigrants’ rights groups. Kansas Secretary of State Kris Kobach, who is now on Trump’s transition team, was the architect of the Arizona law. Immigration lawyers looking for reasons to be optimistic about what Trump might achieve also point out that conservatives in Congress and some state legislatures have tried, and failed, to cut funding to “sanctuary cities” in the past. That’s in part because of overwhelming opposition from large swaths of the law enforcement community, said Denise Gilman, director of the immigration clinic at the University of Texas School of Law. “Every police department has to make decisions about how to best go about policing efforts, and most jurisdictions have decided that if local police are known to be enforcers, it harms their ability to police effectively,” Gilman said, adding it would be bad policy for Trump to impose any sort of requirement on local law enforcement. When “sanctuary city” legislation has been taken up, local enforcement officials have regularly descended upon capitol buildings to explain that enforcing immigration laws could be problematic, not just because they’d be doing the federal government’s job but also because it could deeply undermine their relationships with the communities they protect. Their argument is rooted in the possibility that witnesses or victims of crimes could be more apprehensive about coming forward and working with police in an effort to avoid any contact out of a fear of deportation. And that could ultimately lead to less-safe communities for both immigrants and native-born residents, they argue. The legal landscape is also in flux when it comes to expectations that local jails should comply with ICE requests to hold noncitizen inmates for an additional 48 hours so federal officials can take them into custody. Earlier this year, a federal judge in Illinois ruled that the federal government’s use of holds on noncitizen inmates exceeds its legal authority. But even without any specifics from Trump or his aides yet, activists and immigrants already say they fear that future traffic stops could become more likely to lead to detention by ICE. That’s a concern that many already have experience with: Gollinelli, the undocumented electrician, was pulled over in October 2014 for driving 42 miles per hour on a road with a 40-mile speed limit. When an officer searched her name, she was found to have a previous removal order. Gollinelli, who has lived in the country for 12 years, said she was held in jail and later moved to a detention center but later released on an “order of supervision” because she did not have any other criminal charges on her record. Gollinelli, a mother of two, said she rarely talks about her arrest in front of her children, particularly her 10-year-old daughter, who begged her not to leave again once Gollinelli was reunited with her family. But she now fears that something similar could happen again — and this time, she won’t be able to come home. Other immigrants, such as Gomez, wonder what would happen if relatives were to be stopped by police enforcing immigration laws. Others like Jose Sic, an undocumented immigrant from Guatemala who has lived in Houston for 21 years, worry that the distress he experiences while driving — caused by fears that he may not make it home — may only get worse. We asked Texas Tribune readers what they thought about President-elect Donald Trump’s plans to deport millions of undocumented immigrants — and here’s what they said. Note: These reader responses have been edited for brevity and clarity, and their stories haven’t been independently verified. I have worked very hard for my education. I do not get federal aid and the state aid I receive doesn't fully cover my schooling. I work a fulltime job and go to school fulltime as well. I fear that if [the Obama administration’s Deferred Action for Childhood Arrivals] is removed I will not be able to pay for school much less remain in this country. I have lived in the United States for nearly 14 years now and I've always felt like I owed something to this nation to repay [it] for all it has granted me. All I want to do is be a productive member of society and I feel like I am not being given that chance under a Trump presidency. I'm a DACA recipient who has lived in the country since I was 2, escaping religious violence from Pakistan. I have no ties to [that] country; my entire family lives here, and only my parents and sister and I are undocumented. I still live in Austin and I think the strong activist community here helps, but it doesn't make me feel safe. If Trump repeals DACA, everything I've worked for in the past 3 years will be worth nothing. With DACA, I bought a house, a car, learned to drive, started living on my own, graduated college and have an income that supports my undocumented family. My undocumented friends and I are scared. We are trying to prepare for what might happen but that seems impossible. It is very hard to describe what it feels like to go back to a life of destitution when you've hit normal. I thought this country was on the right track, and within a few years, we'd pass something to help undocumented families who've lived here for decades and call America their home. I was planning on applying to an MBA program next year but I'm likely going to have to hold off on that until Trump decides what he's going to do with DACA. My entire life is grinding to a halt yet again and it's terrifying. I have so much to give to this country and to my community. The fear and uncertainty leaves me and so many like me in paralysis. I have nowhere else to go in this entire world. I am a large animal veterinarian. A significant percent of my clientele is Mexican immigrant as well as the majority of the labor force in our local animal industry. They are the best of what this country represents and they are here because we have created a market that demands their skills. Right now they are more worried about their futures than I have ever seen. They are my friends and I care about them, and the success of my business is inextricably linked to theirs. I am a widow with a thoroughbred horse farm. My barn help applied for a green card under George Bush’s program before 9/11. He never got it but did get a tax ID number and has been paying taxes all these years. Without him I would probably have to go out of business as it is a physically demanding job. By the way — he makes $20 per hour. The President-elect’s proposed draconian changes to our immigration system will dramatically impact not only undocumented immigrants, but American businesses who thrive on skilled and unskilled labor, and more importantly, anyone who cares about this nation’s values of fairness and equality. His xenophobic and racist rhetoric will make this country more polarized than ever. Some have already left. I suspect they'll come back when things quiet down. Mexicans have been coming here for longer than I've been alive. The difference now is that we pay them to stay with our tax dollars and their wages. They don't go back home anymore. 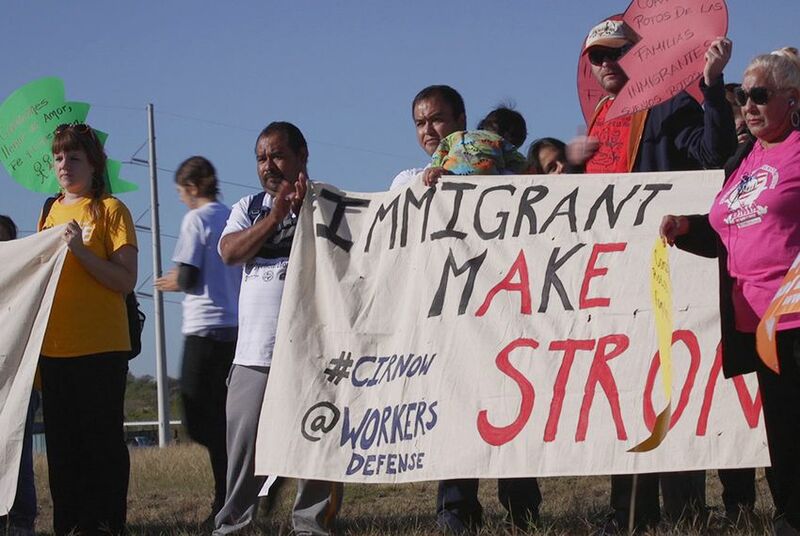 I'm from a community, Corsicana, with a significant population of undocumented immigrants. We made the news last summer when ICE agents stormed into town, snatching up "criminals." Some of these men and women had only speeding tickets, or decades-old charges that had already gone through the system. For three days, many folks didn't leave their homes, go to the store, church, etc. The environment of fear it created was astounding. I helped two organizations lead talks and hold legal advice seminars with community members who felt safe enough to leave their homes. It was incredibly beneficial. I believe this environment of fear will only increase under Trump. I see more ICE raids of the like happening under his administration, and it infuriates me. It's an overreach by the federal government that taxpayers are unwittingly over-paying for. It won't affect me because I came here legally went through the naturalization process to become a citizen. I think it will create an atmosphere of hate, distrust and anger, but I'm hoping that it also leads to Mexican Americans getting organized and fighting back against the militarization of the border and the building of any more walls in South Texas. I think undocumented residents will suffer harm and constantly be in fear of being deported.